Last week, after we returned from my mother’s funeral in Pittsburgh, PA, I decided that today’s One-Liner Wednesday was going to be a “thank you” one-liner. We had encountered so many caring and supportive people; family, friends, friends of my mom and total strangers, that it seemed appropriate. Some of those people will be featured in future posts, who knows when – but they all need to be thanked. 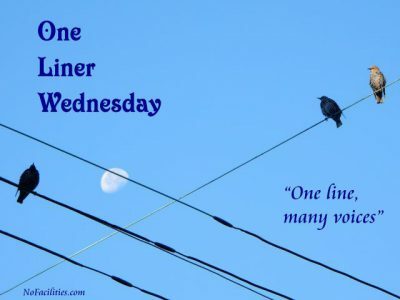 Of course, later last week, Linda announced the contest for the new One-Liner Wednesday badge. I had been waiting for that announcement since last September, when I snapped the pictures of those birds. I submitted, you liked, you voted and I won. So, once again, “Thank You!” seems to be a good thing to be saying. I thanked her. I could try to thank everyone, but I think Natalie Merchant does it better. Thanks Judy. They treated us so well that weekend. Even the woman I spoke to when I was making the reservations – she was so accommodating; we didn’t know, at first, what day we would arrive. She booked three rooms that were near each other and let it float with our plans. Simple stuff, but nothing they had to do, and it made it so easy for us. Thanks Gwen. I’m trying to remember this lesson and I will try to pass it on. There really are kind angels in the world. Congratulations on the badge selection. I really love it. Thank you for being you. Aw, thanks Cheryl. It’s amazing how little acts of kindness go so far to make someone’s day better. I’m glad you like the badge. We so often hear the stories of people behaving badly. It’s nice as a counterbalance to read stories about kindness and caring, especially in those times when it really matters. I’m glad the world around you stepped up for you and your family. Even those little things can mean a lot. Thanks Joanne. The people at that hotel couldn’t have been nicer. It really did mean a lot. I love the expression ‘angels in our midst’ because sometimes they let you take a peek and see who they are. They are very special people. Congrats on the win, Dan. Yay!! Thanks Lois. These people really are special. Little acts of kindness mean so mcuh. Isn’t that a good thing :) Thanks. All the badge entries were good ‘uns, but I truly did like yours best. Congratulations on the win over stiff competition! I’m so glad you met such kind, caring people when you needed caring most. The number of decent people far exceeds the number of uncaring or malicious people. That’s why bad behavior is news. Thanks Marian. I never thought about it like that, but I did encounter a lot of kind people. I’m glad you liked the badge. Dan, I’m so sorry! I didn’t know, and I’m glad you found some people in the hospitality biz who actually know what the word means. A blessing on their heads, as was sung in Fiddler on the Roof — and on yours, Faith’s, and your family’s too. Thanks Steve. We’ve been moving non-stop for the past couple of weeks. I appreciate the blessings. The people at that hotel truly understand hospitality. There is hope for us, yet. Thanks for the Natalie Merchant song, so fitting for the kindness within this circus of life. I had not listened to her in a while. Thanks JoAnna. I think there is hope. It’s a nice feeling when you have kindness turned your way. This is the first I’ve heard of the loss of your mother. I’m so sorry, Dan. It’s wonderful that you encountered many kind people in your travels. Comforting. Thanks Linda – this can be our little secret ;-) Not knowing what to expect while trying to make somewhat complex arrangements, and finding people stepping up and just being willing to help, made us all feel better. Oh, my, I didn’t know, either. My condolences on your loss, and my congratulations on your win. Life can be crazy, can’t it, but indeed, thank God for those souls who remind us what it’s all about. Thanks, and thanks. I think it does serve as a reminder of just how little it takes to make people feel so much better. Even a genuine smile or a seemingly personal “hi” can change a bad mo(u)rning for the better. So, so sorry to learn about your mom, Dan. But I’m glad that the people you came in contact with were kind, and hopefully made a terrible situation in some small way a little easier. On the brighter side of life, congrats on your badge design win! Thanks Wendy, for the condolences and the congrats. The kindness we were shown did make an otherwise bad weekend much better. And, I have to tell you, Wendy. One of the things of my mom’s that had been in a pile to go to Goodwill was a Scooby Doo blanket. I retrieved that and brought it home. I’m sorry, I didn’t know whether to put the :'( face or the :’) face, because I kind of felt both of those things equally when I read that! The :) works. I didn’t know until last year that she liked Scooby Doo. She had the blanket, a scarf and character magnets holding notes up on her fridge. No one seems to know when she came to like the cartoon. I never watched it as a child. Well, she clearly had excellent taste! A charming midweek post, Dan. That was amazingly sweet of them at the hotel. I’m glad you shared it, because that kind of thing is so rare now. Hugs. Thanks Teagan. I’ve always had good luck with these hotels (Marriott) but a lot of people fall back on “the book” or “our procedure” or some other way of charging you for the convenience. This was very much appreciated. “I have always depended on the kindness of strangers.” There really are lots of kind people in the world. 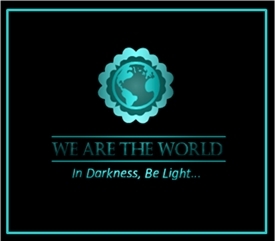 We just always here about the unkind or evil ones. Goodness all too rarely gets headlines. Thank you for taking the time to highlight a few. Thanks Janet. It’s true, we don;t hear often enough about the legions of kind folks out there. They make life better, one nice deed at a time. Ah, that recount gave me goosebumps! What a lovely person, and thing to do for your family. CONGRATULATIONS!!! I look forward to seeing your Badge posted on the One Liner Wednesday posts in the future!! Thanks Deborah. The woman was so nice, and it felt so good to have one part of a hectic day removed from our concern. Thanks for the congrats. I am happy to supply the badge for a year. Linda does such a good job with these prompts, and I really enjoy this one. Thanks Kirt. I think you’re right. I think the people who have commented that maybe meanness is rare and that’s why it’s in the news, are right. I certainly hope so. Have a great week and a nice holiday weekend. Congratulations on the win, Dan! Thanks Mary, for everything. Kindness is so powerful and so important. It’s heartwarming to know there are wonderfully thoughtful and kind people out there Dan. I’m glad you enjoyed this. It is wonderful to realize that these people are out there, perhaps in greater numbers than we realize. Congratulations on the badge. Now, what are you going to do about North Korea? Sometimes people are terrific. I’m glad you experienced those times. I’m hoping to open a dialogue, John. I’ll have my people reach out to his people. Either that or I’ll build a wall in space. Thanks. Excellent. I think it will really, really, work out really, really, well. “One line, many voices” Those birds on the wire… just perfect! Good thing it won. Again, so sorry about your Mother, Dan. You are very welcome, Dan. It’s good to know all went well there and yes, thoughtful and nice people are out there and often they are not being mentioned enough. Good to know they are around to be supportive for you and your family. By the way, congrats on the win too! Thanks. I think there are lots of nice people out there. Simple acts of kindness go a long way. Random acts of kindness are the best. First of all, I am so sorry because I must have missed one of your post about your mom. I have been trying to spend less time online. And I am sorry. I met your blog through a mention to your heritage and your mom was part of this old blog post. So please accept my belated condolences. And of course, bravo for the win. Well done and well deserved too. Thanks Evelyne. I appreciate your kind thoughts. Everyone if busy busy, so don’t worry about the timing. I appreciate your dropping in when you can. Love kindness of strangers and the song was really pretty by Natalie Merchant. Hope all is going well and hope not too much sadness for a blessed life well lived. Peace to you and your family, Dan. Thanks Robin. I really like that song. Things are going well. Aw. I’m glad you had a nice weekend. Thank you, Dan. There was some beach fun, some great family time and good food. All the makings of a great weekend.